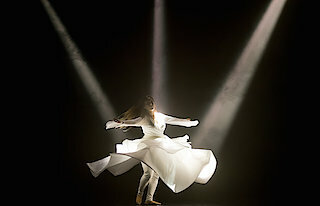 Sanjukta Sinha, one of India's most distinguished Kathak dancers, combines traditional Kathak with contemporary dance. The result is Kin, a piece consisting of three parts that sets out to discover the core of the self and the roots of emotions. While illumine is the search for the pure white light that connects us with the divine, id asks the most existential of questions: Who am I? In conclusion, incede takes us on an excursion to the realms of love and longing.